Product #21936 | SKU SHM-SD1 | 0.0 (no ratings yet) Thanks for your rating! Designed to prevent vibrations and handling noise from reaching your small diaphragm or shotgun microphone, the SHM-SD1 Clamping Suspension Shockmount for Small Diaphragm & Shotgun Microphones from Auray features all-metal construction with a felt-line cylinder to protect your mic's finish. 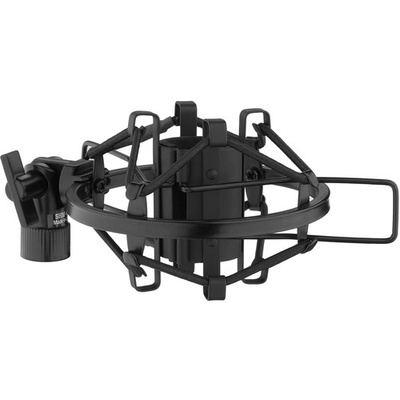 Its heavy-duty elastic bands suspend your mic in the basket's centre, and prevent vibrations and shocks from hitting your mic. It has a 5/8" threaded connector, and includes a 3/8" adapter.